This is one of those journal pages that pretty much tells the whole story. I’ve been on a crazy ride in the last few weeks with lots of travels, selling a house, buying a house, and tons of work. But as these pages convey, I’m thrilled to have this new beginning and to be landing closer to family, friends, and work when the transition is complete. I’m also grateful to be moving to a restored historic house with a great basement, new roof, and nesting phoebes and robins. Pages of chaos expected in the weeks ahead! Tips & Techniques– Try using your basic sketching pens for hand layering. I use a Micron 02 or 005 black pen with archival ink for both sketching and lettering, which saves me carrying around a variety of calligraphy pens and inks. Write your text and then and build up the thickness of the letters to add interest. 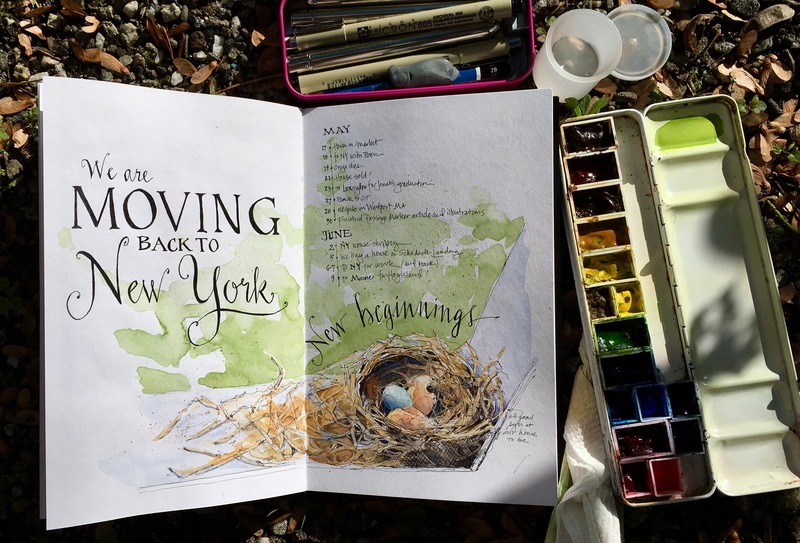 This entry was posted in Birds, Journal, Nest, Watercolor and tagged bird eggs, bird nest, birds, hand lettering, spring by Jean Mackay / Drawn In. Bookmark the permalink. Know you are happy…….yeah! Have fun on the Island. Thanks Lucinda– Yes, I am! Wow! That’s exciting news! Can’t wait to hear more! Lovely sketch, as always! Good luck with the move! Thanks Missy- our new house has lots a great sketching potential– can’t wait! Good luck on your move beach to NY. Have a wonderful week on Hig Island. I’m writing from Jasper Nat’l Park, Alberta. This all in WC, no pencil or pen, but I only had about 30 minutes in mizzle and just went for it. It needs more definition later when I have time. Whew! A lot of change….but you captured the spirit of the future so beautifully. (And barely into NYS? Made the back and forth a bit less frantic, I am sure.) Enjoy Hog Island and best wishes for your new home. Thanks Beth- it’s nice to have Hog Island amidst all of the change. What a beautiful spread! I hope your new ‘nest’ will be as warm and homey as this one looks. Thanks Lisa! I hope so too! What an exiting time, and a beautiful post and illustration to mirror it – I agree, the nests were a very good sign. And you’re in a favorite part of the world, how fabulous. The first time I drove up there on a road trip was way back in the mid 70’s. I fell in love with the area over by East Chatham. I look forward to hearing more about all that’s going on, and seeing more of your watercolors. Best of luck, and Happy New Home to you! Remember to rest! I can’t think of a more perfect housewarming gift for you than to find a bird’s nest waiting for your artistic touch, Jean! Recently, a robin’s nest blew out of one of our trees during a storm, so I made my first attempt at sketching one. Even though it’s much different than the robin’s nest, I propped up my print of your catbird’s nest on my art table for inspiration. I never tire of looking at your nests. I hope you are very happy in your new home. A restored historical house sounds wonderful! Great Sally! I hope to get plugged into existing networks or create a new one — I hope we get to meet in person. Welcome to NY although I am in the city part. But born and bred here and have no intention of leaving. Love your drawings, I have many journals but yet to draw in any of them….. Thanks! With so many sketchbooks, sounds like it might be time to make the leap and start drawing! Thanks much! let the packing begin! This is beyond stunning! Love your style. Thanks so much for poking around my blog. I appreciate it and glad you liked what’s here.